Our July 12th "Independence and Growing Up" Reading Clubs are filling up very early since these are traditionally the smallest clubs of the year. We don't want our supporters to miss out, so if you know you can join us on July 12th, sign up today while there are still spots available! YOUR VOTES HELPED US WIN! If you are a member of our Facebook group or follow us on Twitter, then last week you heard the good news that Fluor has awarded us a $10,000 grant! Thanks to your online votes, we were one of the 5 U.S. winners of their 2014 Fluor Global Community Project Fund! You can see more details at the above website. Your votes helped us secure this grant, so we could not have achieved this without you! We especially wish to thank Reading to Kids volunteer and Fluor employee Jinhwa Chun for her sponsorship and help in writing this grant. We even made the international news! On her blog about this project Jinhwa has already started posting about Reading to Kids and Fluor employees' involvement. Click on the photo below for a larger version of the check presentation from Fluor to Jinhwa and Reading to Kids Managing Director Charlie Orchard. Fluor's grant will help us continue serving underprivileged Los Angeles children by helping us host a "Wonders of Science and Technology"-themed Reading Club in November (which is also our annual College Spirit Month). Fluor volunteers will join us as we read to the children and have a discussion about the importance of science and technology-based fields of study. 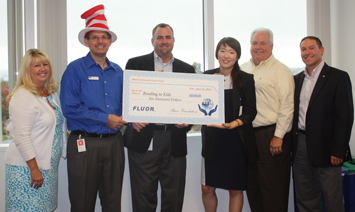 We look forward to welcoming more Fluor employees as volunteers! Reading to Kids is hiring two Literacy Coordinators for 11 month positions starting in September! The positions are posted on our website, where you can read them by clicking on the Literacy Coordinator button below Latest News. Please also share the above link to the positions with anyone you think would be a good fit, especially if they have volunteered with us as readers or other roles. Thanks, and we hope you are enjoying a wonderful June! - Thank you Fluor & Supporters - your votes helped us win!